Kitchen! Kitchen! 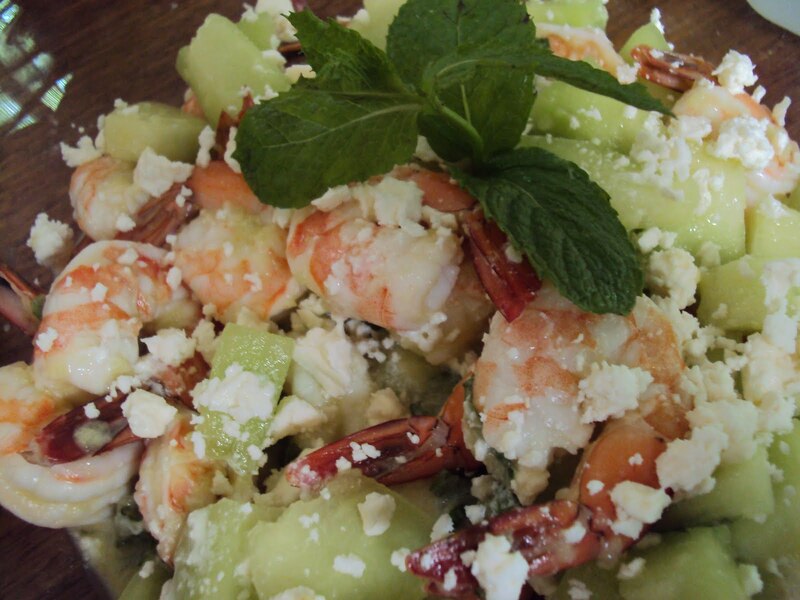 : shrimps & honeydew salad......at kitchen! kitchen! shrimps & honeydew salad......at kitchen! kitchen! This is my take of Lidia"s Italy "Coda di Gamberi con Melone". postings are some of her dishes but with a twist. In a large pan bring to a boil with some chopped onions and bay leaves; boil for 20 minutes- then add the shrimps and cook for 3 minutes. Drain and let cool. In a large bowl - gently combine diced melons, shrimps; teaspoon of chopped mints; pepper, and salt together. Add the fresh lemon juice and olive oil and toss gently. Sprinkle the crumbled feta cheese and garnish with a mint sprig.